Sending a photo Christmas card is a holiday tradition for many families. Cards with photos let friends and family get a snapshot of your family's life through the previous year or during the holiday season. With so many retailers offering this service, it's easy to pick out one that reflects your family's personality. Fotor is an excellent option for designing a card that won't cost you a lot of money. The free printable photo Christmas card templates allow you to upload photos from your computer, Facebook, Picasa or Flickr account, or webcam. Simply click the "Get Started" button and you'll be taken to a page where you can choose the type of card you desire. Click on the Christmas tree in the left toolbar and pick one of the resulting designs. Upload your photos and then personalize your card before you print. Designs include a holiday plaid pattern, stockings, cityscape, and more. Sound/song cards: Choose one of the folded photo cards that also allows you to choose a song that plays when the card is opened. For example, one card features Santa and a penguin near the photo area and could play "A Holly Jolly Christmas." These cards are priced around $6 per card. Magnetic cards: Save your family and friends the trouble of finding a magnet to hang up your card with by turning the card into a magnet itself! These flat cards come in a variety of styles featuring holiday lights, garlands, snowflakes, and more. Pricing is under $3 each, though individual prices drop with additional purchases. Specialty insert cards: If you have printed photos that you can't scan into your computer, choose the specialty insert cards. They allow you to insert a printed photo into the folded card. These cards come in a variety of styles including foil or laser cut designs. The cards cost about $6 each. Minibook card: Get seven pages in a Minibook that you can design with text and photos to suit your needs. Each one is 5x7 and mails using just one stamp. These cards are more expensive than traditional flat cards, with 15 of them starting around $90, but the more you order, the more you save. Smart & Chic: In the Smart & Chic category, you'll find petite and postcard photo card options with festive graphics and sayings. These smaller cards are priced affordably. Petite designs start at just under $50 for 25 of them, and postcards begin at just under $45 for 25. Both designs offer savings with bulk purchases. Exclusive: Minted carries two exclusive designs - foiled cards and ornament cards. Their foiled cards come in either silver or gold that actually shines. They start at around $70 for a package of 25, with the price dropping the more you purchase. Ornament cards come in a fun shape with a hole in the top for hanging with the included ribbon. Pricing starts at under $45 for 10. Spinner designs: Look for a design with "spinner" in the title like the Foil Photo Spinner, and you'll find a card that has a circular spinner in the middle that allows a special message or photo to show through a cut-out in the front. You can buy these designs in small packages of eight starting at $31. Extra postage will be needed for mailing. Ribbon designs: Check Pear Tree's selection of ribbon designs to find photo cards that can be strung and hung in stocking shapes, as ornaments, or strung up like garland tied with twine. Prices vary for the different ribbon designs, and larger quantities do garner lower prices. Coloring book card: Get two cards in one when you choose a coloring book Christmas card. You'll be able to upload your own photos into the card, and the children who receive the card will be able to color the designs on the inside, whether they are Christmas trees or candy canes. Cards start at $3 and are sold in quantities of 25. Social networking site card: Families who connect through social media can find a special card that highlights their everyday form of communication. Use this card to create a personalized "update" to mail to friends and family with nine different photos, along with captions and comments. These cards are available in sets of 25, at $2.75 per card. 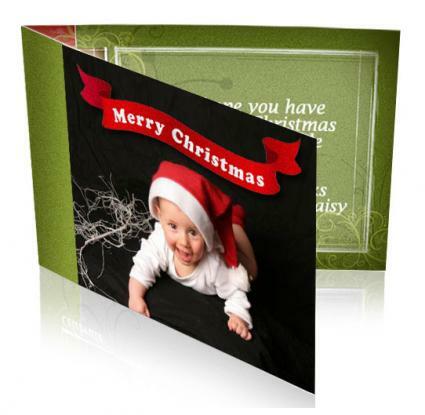 Personalized photo card: Add some festive fun to your card by choosing this design. It allows you to customize thought bubbles to send a message directly from your mouth in the photo. These cards run $2.50 each and are sold in quantities of 25. Photo selection: Choose a photo that is well-lit and clearly features everyone's faces. If you have to do a lot of editing, it may not print out as well as it looks on your computer screen. Color: Look for photo cards that use similar colors in their graphics as those people in the pictures are wearing. This way your card looks cohesive. Theme: If you are using a photo that was taken outdoors, choose a card design with a nature theme. Similarly, look for stockings or Santa on cards with kids, or elegant flourishes for a posed portrait. Materials: Recycled paper is great for eco-conscious shoppers. Glossy photo cards are often cheaper, but matte prints offer a more refined look to your card. Foil, laser cut outs, and other embellished materials add pop to your cards but often will cost a little extra. Smiling faces having fun is a wonderful way to share your holiday cheer. No matter what photo card you choose, you're sure to brighten everyone's day when they receive your Christmas greetings.